Plan your day and plan a workout. Having a hectic schedule can be stressful. By taking a second and looking at everything you need to complete for the day as a whole, you can spot places you have a break or some down time that could be spent at the gym. After you determine when you have free time, plan out exactly what you’re going to do at the gym. By pre-planning your workout, you wont find yourself wasting time sitting around trying to think of something to do. Coming to the gym with a plan is great way to get in and out in the shortest amount of time possible. Know your gym. It’s important to know your way around your gym when exercising on a time crunch. Having prior knowledge of the location of your preferred equipment will make for a more convenient work out. It may also be beneficial to know when peak hours are at your facility. You may have to wait longer for weights or equipment if you go at the busiest point in the day. Exercise early. Working out early actually yields both time and health benefits. By beginning your day with a trip to the gym, you’re less likely to lose motivation to work out. As the day drags on, we think about all of the things we still have yet to accomplish. Working out becomes less of a priority when you have a lot to do, so getting to the gym first thing in the morning essentially tricks your mind before you know what you’re doing that day. You also get an added health bonus by doing this. When you hit the gym in the morning, your metabolism begins to speed up and continues to burn calories for the remainder of the day. If that isn’t an incentive to go to the gym in the morning, I don’t know what is. Cardio: utilize interval training. Interval training is a great way to burn a significant amount of calories in a small amount of time. An example of this kind of work out would be completing a cycle of walking, jogging and sprinting, then repeating it three or four times. 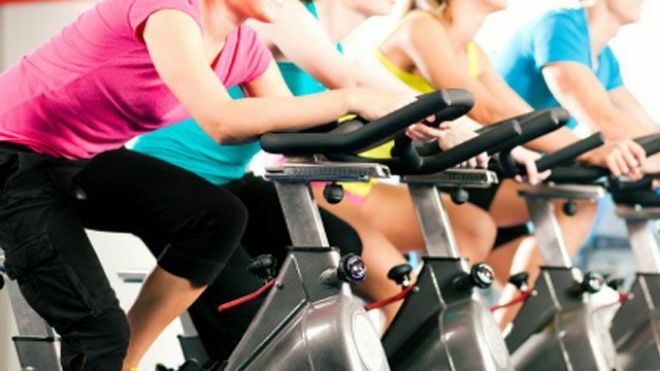 Instead of doing 40 minutes of cardio, you can still burn the same amount of calories in half the time. Pinterest has some great examples of interval workouts you can try! Muscle Building: circuit training and compound movements. There are a few different ways you can build muscle without sacrificing a large portion of your day. Circuit training is a short, full-body workout that works great when integrated into tight schedules. It involves moving from exercise to exercise immediately after one another and using moderate weight and numerous repetitions. Bodybuilding.com has a great variety of articles that talk about circuit training and various exercises you can complete. Using compound movements in your workouts allows many muscles to be worked at once as opposed to isolating and working one muscle at a time. Many of the weight machines found at the gym will isolate just one muscle or muscle group. By utilizing barbells and dumbbells, you can work a variety of muscles at once, which in return burns more calories and saves you time. Snack on the go. After you complete your workout, bring some high-protein snacks with you to refuel and rebuild muscle. Peanut butter, hummus and protein shakes are all great things to eat post-workout. By packing some simple snacks with you to eat after the gym, it eliminates time (and money) you may spend stopping elsewhere to grab a bite to eat. Next Post Tony Telloni visits Scripps PRSSA – 3/10 RECAPPED! Reblogged this on The Many Thoughts of Mira Kuhar.